In previous posts I have mentioned the process of academic writing and how draft stages and editing stages are integral to any essay at University. This cyclical process of reading, writing and editing is only possible if you leave enough time. Time management is therefore one of the key skills to learn when entering University life. Universities nowadays recognise the difficulty some students may have with time management and so even offer time management courses. Ironically, these tend to be badly attended because students “haven’t got the time”. The easiest way to introduce effective time management is by preparing schedules. You should have three schedules, one for the long-term, one to cover medium-term goals and one weekly plan to help you with the day to day events. This is your timetable for the week. Plan for all activities academic and non-academic so that you know how much time you have at your hands. You should include reading and writing time, scheduled classes, private study time, but also any extra-curricular activities and clubs you participate in. Mostly, your weeks will be quite similar, but the work you do in your study time may change, for example. This is your schedule for the term. 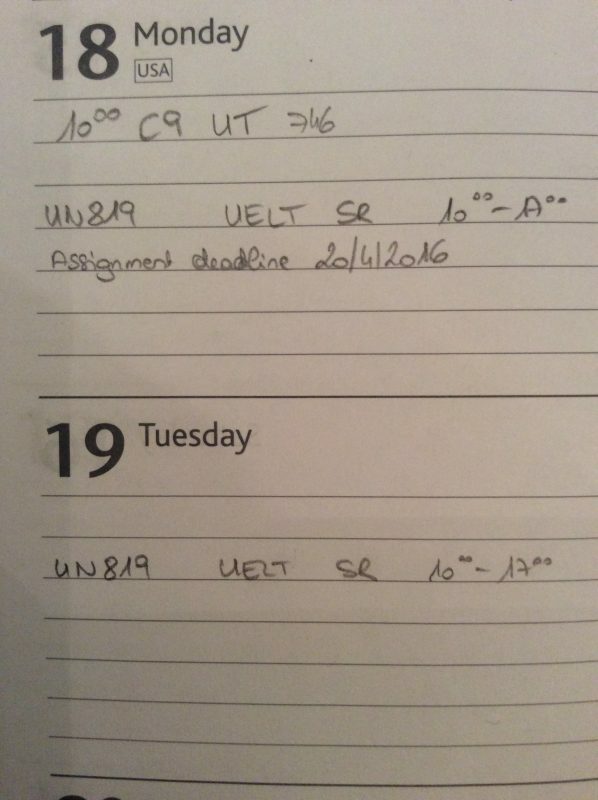 Identify the most important dates and deadlines you need to adhere to and highlight those in your termly schedule. This should then help you plan revision and editing times within your weekly schedule. For example, one week before your assignment is due you should only factor in for minor editing and proofing work. Two weeks before the essay deadline you should start the proofing process by reading your work critically as if it was somebody else’s work. At the beginning of each term you can start looking at the coursework requirements for the modules you are enrolled in. In some cases you may be given a date when you will be informed of the coursework details. If this is true for your module you should start reading literature that are core to the course as well as any related publications. Even if you are not able to start drafting ideas, you will have gained content knowledge that will make your writing easier. See here for how to read literature systematically. Throughout your studies you will find that there are times where you are stressed or disappointed and you lose sight of what it is that you are trying to achieve. Having a long-term plan covering the full duration of your studies will help you keep your overall goals in mind. As with all writing processes you may want to experiment with different formats. For some people an online schedule works best, for others individual paper copies is most effective. Personally, I do not have a weekly schedule. However, I still have three schedules, one daily plan that I write every morning on scrap pieces of paper, one short-term schedule with all my deadlines and formal tasks, and my long-term goals that I refer to in my reflective diary. The major advantage of having three schedules is that time management becomes more effective and efficient because you never lose sight of important dates and times. Another advantage of having these schedules is that they do not only help with time management, but are also proof of your achievements. As you complete a week or a term you can look back and you will see how much work you got done. This will immediately lead to a sense of achievement. 2 Comments on "Time management"
As a student, it’s very important to manage your time between things and make sufficient time to study. Thanks for sharing this important tips on time management. Time management is not subject of interest of many students but it’s the job of universities to create this interest among the students. Thanks for sharing this article got some important tips.